Remote support is a sharing session in which we are able (with your permission) to view and control your computer from our facility. This type of support enables us to work on your computer in many circumstances without you having to unplug it and bring it to us.control your computer from our facility. Remote support can only work if your computer can successfully navigate to this page. Through this type of connection we can fix viruses, install programs and provide an array of services while you watch. For our corporate customers, we use a similar application for "always on access" in cases where you request it, that we can monitor your network, make regular backups, or other needs whereby we need unattended remote access to your system. Clicking the link above will open an executable file. You may receive a virus warning, but this file is secure. Please call us and have us on the phone before running this file. 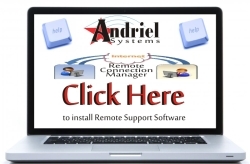 Our support program is a trusted, industry standard remote support application which has been re-branded for our use. Encryption is in place, along with our own internal passwords, ensuring that no one else will be able to connect to your computer except us while this program is open. Never give anyone the information in the green box ("Your ID") except for an Andriel Tech who asks for it. This number identifies your computer as the one we wish to connect to among other clients. Copyright © 2014, Andriel Systems. All Rights Reserved.